Does royal jelly improve fertility? Yes! You are what you eat so, of course, we should all choose what we eat carefully. Juicing is one of the healthiest ways to get vitamins and minerals that are needed for a healthy body. The juicing process maximizes our nutritional intake and provides us with a healthy dose of nutrients right when and where we need it. We are living in stressful times so it is even more vital to get the right nutrients and antioxidants for combating stress. In this guide, I will teach you about using a masticating juicer and will also review 4 of the best masticating juicers out there for every budget. 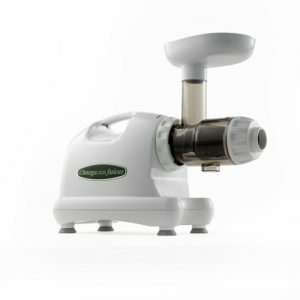 I want to make sure you make an informed choice when it comes to buying the best masticating juicer. 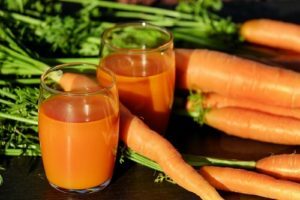 What is Juicing? And why Should You Use A Masticating Juicer? Juicing is the process of separating the pulp of fruits and vegetables from their liquid/juice. By drinking juice, you get tons of vitamins and minerals without having to waste time digesting pulp and fiber. Naturally, for getting the most out of juicing, you need a good juicer. There are several different kinds of juicers available in the market the main ones being centrifugal and masticating juicers. The main difference between centrifugal and masticating juicers is that the former juice at very high speeds while the latter are slow speed juicers. Unlike centrifugal or high-speed juicers which turn at speeds of 10,000 rpm (revolutions per minute) or more, masticating juicers juice at slow speeds up to 160 rpm. This produces little or no heat in the juice as compared to that produced by centrifugal juicers. As a result, the juice produced is fresher and more nutritious. Masticating juicers also use a masticating or chewing action that ensures a smoother extraction process to preserve nutrients in the juice. 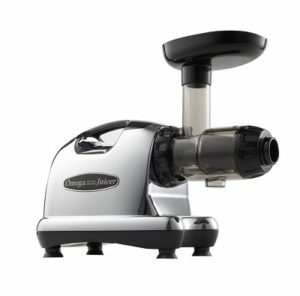 Slow juicers have augers that are special blades which crush the produce against a sieve to separate the pulp from the juice. Therefore, you can use masticating juicers not only for juicing but also for making sorbets, ice creams, nut butters, baby food, smoothies, salsas, and more. Masticating juicers also have a quieter operation, produce a greater yield of juice, and are also capable of juicing small produce like wheatgrass blades or pine needles which centrifugal juicers are often inadequate for. Hundreds of satisfied juicers have given this product a 5-star rating. 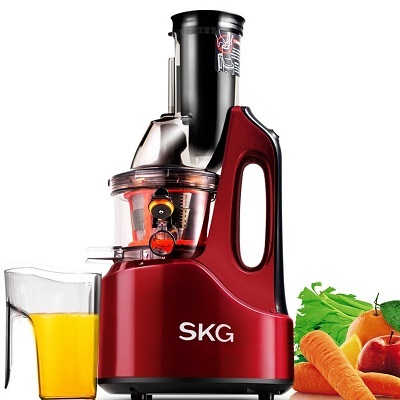 Its slow speed ensures minimal oxidation resulting in healthier, more delicious juice. The wide chute allows you to juice large fruits and vegetables with ease without having to chop them up first. The yield of juice produced is also very high. The design of the SKG is sleek and beautiful with a piano varnish finish, which makes it an ideal gift. Use it to make sorbets, tofu, and ice creams. The juicer can work continuously for 20 minutes or more at a time and all of its parts are BPA-free and readily available, should you need replacement. On the downside, some users felt that it is difficult to assemble. And compared to other juicers in its category, it tends to leave a lot more pulp in the juice. Looking for the best masticating juicer under $300? Then the Omega J8004 won’t disappoint! It ensures a clog-free operation and produces a very dry pulp thanks to its dual stage juicing which extracts all nutrients from the produce. It is also wonderful for making homemade spaghetti, baby food, and frozen desserts. The Omega j8004 has a quiet, dependable operation and is very easy to clean, dishwasher safe and ideal for juicing wheatgrass and other greens. More than 1500 happy users have rated this as the best masticating slow juicers under $300 on the market. 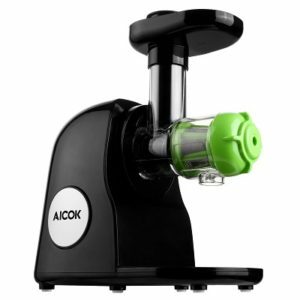 Aicok slow masticating juicer is one of the best masticating juicers below $200 which produces massive amounts of juice with a noise-free operation. Juicing ginger, celery, wheatgrass, and other difficult-to-juice produce is all easy thanks to this baby. The assembly and cleanup of the Aicok is also quick and easy-both being essential qualities you should look for in masticating juicers. It works great for mushy and soft fruits like berries, melons, and grapes without any annoying clogging. The juice that comes out is cold which means it is healthier and non-oxidized. It also produces tiny fiber pellets which you can easily feed to young kids or use as compost. On the downside, you cannot use it for making almond milk, nut butters, etc. and is also not dishwasher safe. Omega is known for the best masticating juicers on the market. The J8006 is the highest rated product in the under $300 category. Near 3000 plus satisfied customers have given it 5-star rating, thanks to its ability to juice continuously with a high juice yield. Its powerful motor comes with a 15-year warranty and you can use it for kale, cabbage, spinach, wheat grass and pine needles! Coffee beans and flour are also easy to handle with this beauty. Its quiet operation allows you to have a conversation whilst working. It has very few cons including small chute size (so you need to chop up harder produce into pieces). It’s plastic cups get stained after few uses and are not large enough to hold all of the juice. Some users had the augers broken in few months of use and replacement parts were costly and difficult to find. And that concludes my review of the best masticating juicers for every budget. To summarize, these are the best masticating juicers from about $35o to $150. Hopefully you’ll find something that works for you and enjoy using a slow juicer! We want to help you live your best life! Our team of writers and editors share their knowledge of natural food, supplements, and healthy living with you. We research and curate the best brands and products to make it easier for you, one of our thousands of readers, to live your best, natural life! Health claims herein have not been reviewed by the FDA. The products reviewed on www.naturesbeststuff.com are not intended to treat, diagnose, cure or prevent any disease. We are not offering advice or instructions about your health. Please consult your doctor before making any health decisions or taking nutritional supplements.